There aren’t many single player open-world RPGs that can hold a torch to the Elder Scrolls series. Morrowind, Oblivion, and Skyrim all launched to wide critical acclaim, setting the bar high with their rich worlds, deep lore, and rewarding systems. 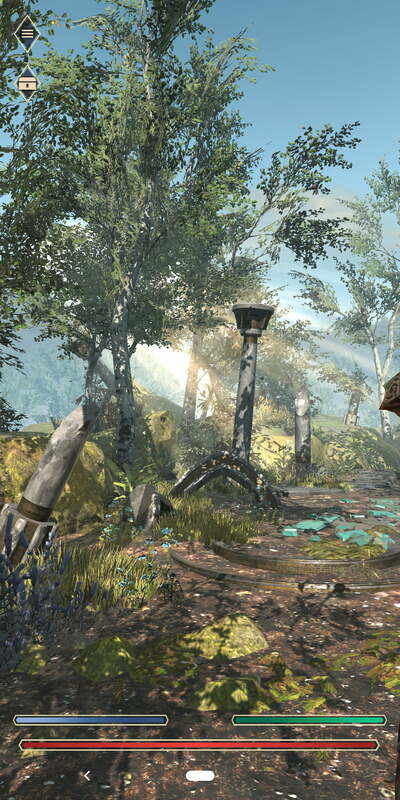 It makes sense that Bethesda would want to bring this fantastical world to the phone with Elder Scrolls: Blades. 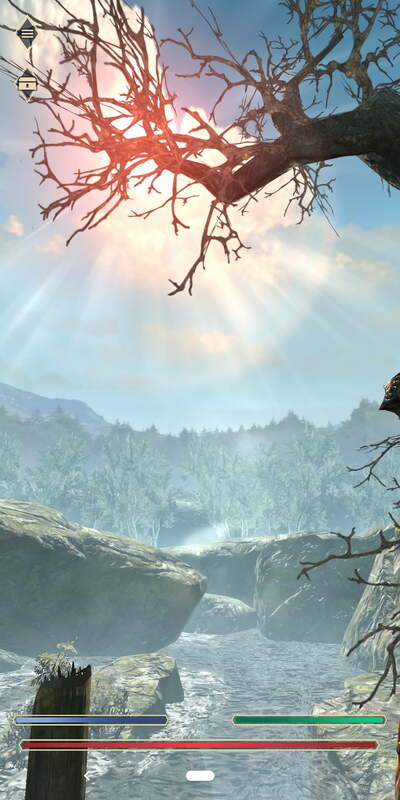 When I first heard about Blades, it was hard to imagine the vast world of Elder Scrolls fitting inside a mobile device. Surely sacrifices would be made? Would the game still capture the spirit of the series? Elder Scrolls: Blades has everything I’d expect — character creation and customization, leveling and skill trees, armor and weapons, and even some light action combat. 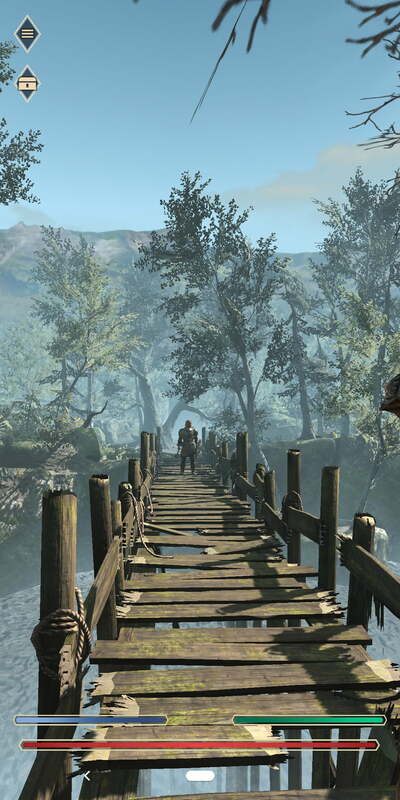 Players can hunt for resources and gain experience by embarking on quests and dungeon crawling through the Abyss, all the while leveling up the town. With all these familiar elements, the Elder Scrolls: Blades shows promise. Yet there are a few areas where its Early Access status is felt. Elder Scrolls: Blades, much like its predecessors, starts with character creation. With two genders and 10 races to choose from, the options feel varied. Each race comes with two bonus stats, which can be anything from increased damage with particular weapons, to resistances to certain magic. After settling on your race and gender, you can then customize your appearance. The customization options allow you to choose from a generous amount of presets such as hairstyle, face shape, eyes, nose, mouth, and facial features, making your character feel more like your own. 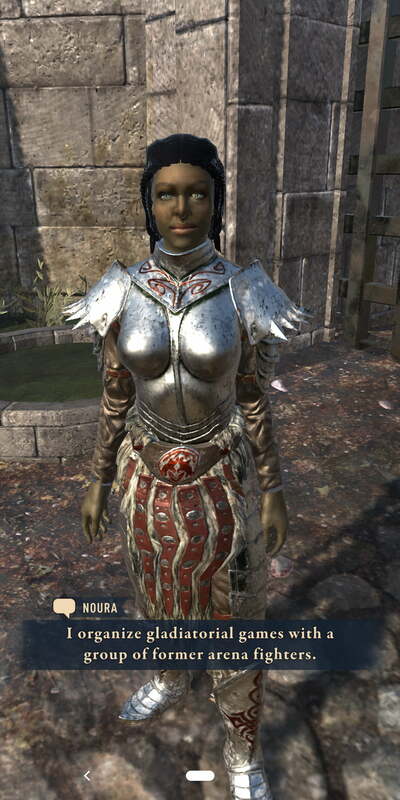 It’s not as deep as the amazing customization found in past Elder Scrolls titles, but there’s still a lot to choose from. After your character is created, you’re thrown into a tutorial that gets you acclimated with movement and combat. The ontrols are simple. Tap in the direction you wish to move, hold and drag to look around, and hold and release around an enemy to attack. On smaller phones, like my Google Pixel 3, playing vertically felt restricting. I found myself accidentally tapping on the wrong things on the HUD, walking into walls, and missing attacks because there wasn’t enough room on my screen. The customization options let you to choose from a generous amount of presets. That was rectified by playing horizontally, but as someone who usually plays one-handed, I found that frustrating. I tried playing on a Samsung Galaxy Note 8, a much larger phone, and had more fun. 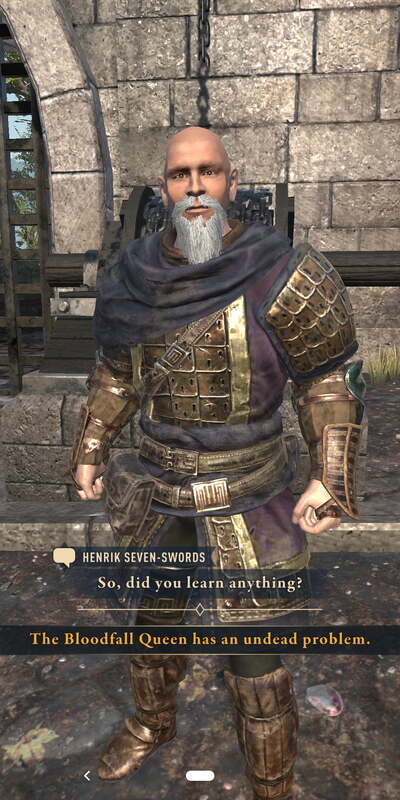 Elder Scrolls: Blades doesn’t waste any time setting up the story. 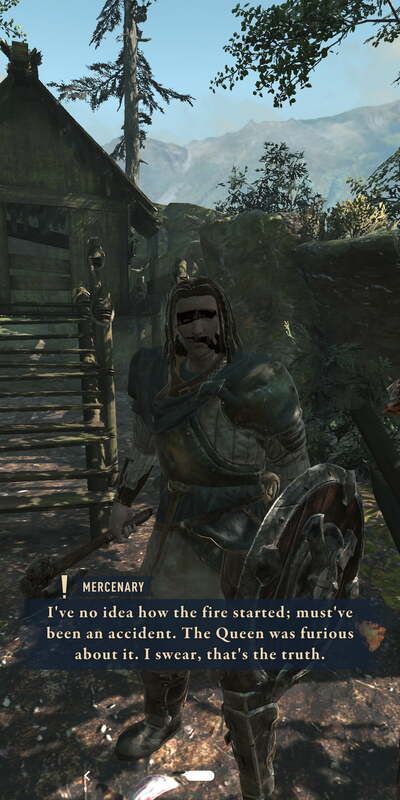 You’ll meet a fellow named Junius the Elder, who tells you the Bloodfall Queen sent her mercenaries to collect taxes from the people of the small, nondescript town you start in. Somehow, things escalated to a point where the entire place caught fire and burned down. Of course, you assume the role of hero, offering to assist the townsfolk with their troubles and help rebuild their home. Yet the story quickly becomes background noise as your compulsion to power through quests and jobs to level up and farm resources render anything NPCs have to say unimportant. It all feels a bit disappointing. 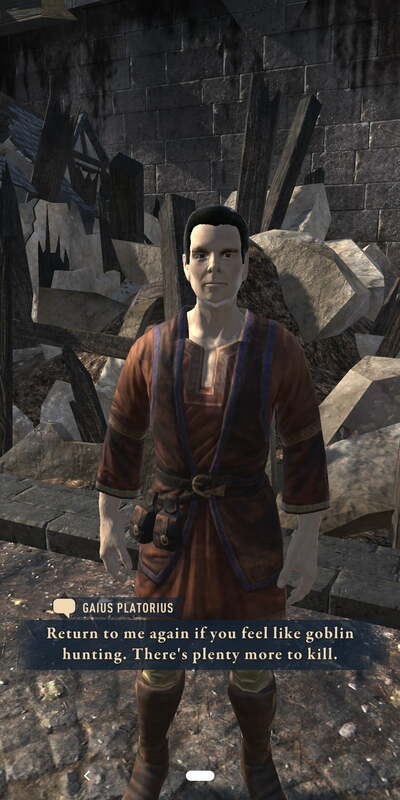 The Elder Scrolls series is known for its wonderful stories and lore. Blades hints at that, but it ultimately feel tighter and less ambitious. Luckily, the joys of dynamic combat and obtaining gear does make its way to Blades, even if it takes some time to get there. Initially, combat is simple and most gear you find is uninteresting. As you level up and difficulty begins to increase, combat becomes more tactical, requiring you to block and parry attacks, as well as consider the elemental and physical strengths and weaknesses of enemies. Gear obtained from quests, jobs, and chests becomes far more valuable. You’ll have to pay attention to what you receive and optimize your gear for your character. Junius will usually have a task for you that’s related to the main story. This is often something like rescuing townspeople trapped in a dungeon or interrogating some mercenaries to get information out of them. These quests tend to offer a challenge and offer decent rewards. You also can’t use Gems, the Blades currency that you can purchase with real money, to skip past them. This is where Elder Scrolls: Blades starts to feel greedy. Jobs, the side content, can be skipped with Gems. Jobs aren’t all that varied, usually requiring you to head into a dungeon to collect a certain amount of resources or defeat a specific number of enemies. They start to feel tedious once you’ve completed yet another spin on the aforementioned jobs, but you’ll want to complete them because they reward you with the resources you need to build, craft, and upgrade buildings, potions, armor, and weapons. Opening chests, crafting, building, and upgrading all take time. 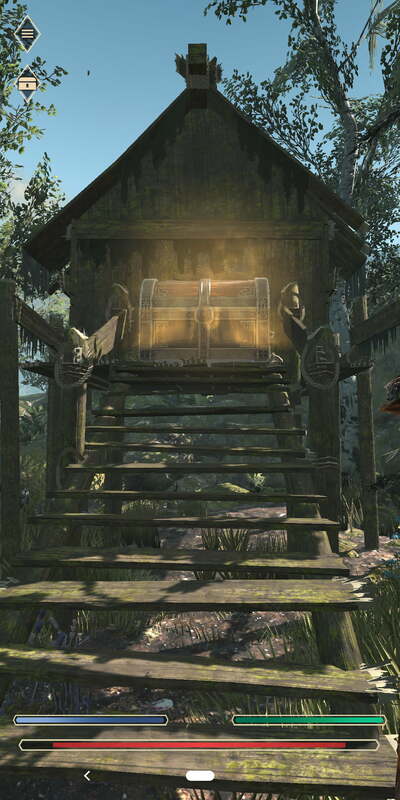 Golden chests, for example, take six hours to open. They are certainly worth the wait because they hold quality armor and weapons along with precious resources, including Gems. But the long wait can pose an issue. Blades is generous with its chests, but of course, space for them is limited. In the span of six hours, you can accumulate enough of them to take up all the available slots, and you’ll always have at least one space occupied by one of the Golden chests — that is unless you upgrade your chest capacity with Gems. This subtle nudge towards paying to play is embedded in just about everything in Blades. As you advance through the game, the requirements of most actions increase, and everything takes more time. Want to build a nice stone house in your town? Well, it’s going to take six hours and five minutes for it to be ready. It’s true that most players can wait for a building to be finished, as it doesn’t really impede your progress, but it’s when you’re making potions or crafting/tempering armor or weapons that this becomes an issue. Waiting 30 minutes to an hour for a piece of gear to be ready feels like an eternity. As you progress through Blades, enemies become more difficult and having strong armor, weapons, and potions becomes vital. You’ll be crafting, building, and tempering a lot just to make steady progress through the game. Waiting 30 minutes to an hour for a piece of gear to be ready feels like an eternity. But, once again, most of these things can be expedited by using Gems. I’ve already spent $15 on Elder Scrolls: Blades. It’s a fun game hindered by its microtransaction-fueled gameplay. I worry that the further into I get, the less fun it’ll be as progress becomes more and more reliant on long wait times — or digging into my wallet. Elder Scrolls: Blades redeems itself with the Abyss, an endless and procedurally generated dungeon where you can farm a ton of resources while earning coins, experience, and gear. And the upcoming Arena, a PVP mode where players can face off against one another, is sure to provide even more reason for players to keep coming back to Blades. That said, Elder Scrolls: Blades is still in Early Access, so I want to reserve my final judgments for when it launches. With a forgettable story plot and the very overt ways it impedes progress in order to get you to spend money on the game, Blades has all the makings of an Elder Scrolls game but currently lacks the charm. But I’m hopeful — Bethesda has been responsive to criticism, regularly updating Blades and even decreasing the amount of time it takes to open chests as it initially took much longer. I hope these quality-of-life improvements continue because Elder Scrolls: Blades is a fun game at its core, but in its current state, that fun is gated by long wait times, repetitive content, and microtransactions.